I have just finished a baby quilt that I started on Friday evening, played with it on the weekend (when not at paid work), and finished it over the last few days. I know you wonder just how I get so much done, in so little time. Well, I do actually spend a lot of time sewing, usually in big blocks when the teens are at school, or late into the evening. Sometimes in short burst whilst being domestic diva and running errands. I don't have a sewing room, but wish I did. My sewing machine and fabric stash live in the open plan living area of our home. It means that area of the house is pretty untidy, and often covered in threads. But it does also mean that I am always ready to sew. 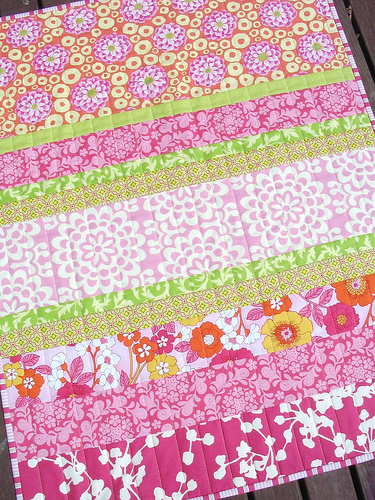 This baby quilt features some of my favorite fabrics (I have many favorites! ), including Amy Butler Prints - Wallflower in Pink and Coriander in Pink both are from the Belle range, and Kaffe Fassett's Bubble Flower in Summer. Both the binding and the featured bird fabric on the back of the quilt are from Joel Dewberry's Aviary collection. For more details or to purchase this baby quilt please visit my Etsy Store, or feel free to email me. This is beautiful! You've inspired me greatly with your strip pieced quilts. However it is you manage such amazing productivity, I'm endlessly impressed. And cheers for living and dining rooms that become sewing rooms... no home space should be wasted! Better that it be thready and creative. Love your choice of fabrics! yummy quilt! 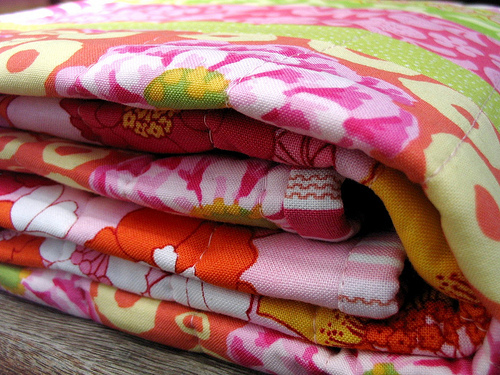 I love all those fabrics, particularly the JD Aviary! Another really pretty quilt. Love the fabric choices you made for this one. Your quilt is beautiful! Your sewing area sounds a lot like mine. I love your use of fabrics. Your straight quilting is always SO straight and even. 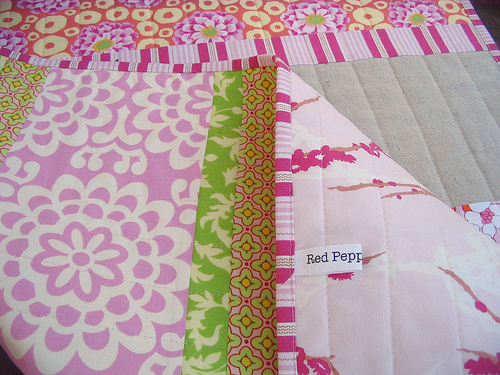 Do you mark your quilts before you begin quilting? Or do you use a guide attached to your walking foot to create those very even spacings? You have a Paid Job too??? Ok, now I KNOW that you are WonderWoman! Here I thought you just quilted all day while I'm at work. Oh. My. Gosh! You ARE Amazing!!!! Really great quilt -- front and back! Very pretty! At this point...I wish I was a baby again. Stunning quilt Rita! What a lovely quilt - and yes, I do know how you do it! So beautiful! The bird fabric on the back by Joel Dewberry is gorgeous. Love the quilt. Those are yummy fabrics! Another beautiful quilt! I especially like the Joel Dewberry bird fabric on the back! Beautiful...so simple but so stunning. This is so vibrant and beautiful - kudos again! I can't imagine you do all this, have kids *and* a job. Simply amazing. I love how this quilt came out. It seems that that is the way most of us quilters get work done, stolen moments. It's lovely and it really is all about the fabrics. You make excellent use of your time, you must be a well organised person. ok - but you still didn't explain HOW YOU DO IT! And you have a paid job too? I'm so envious of not only your talent, but your ability to get it done so quickly! 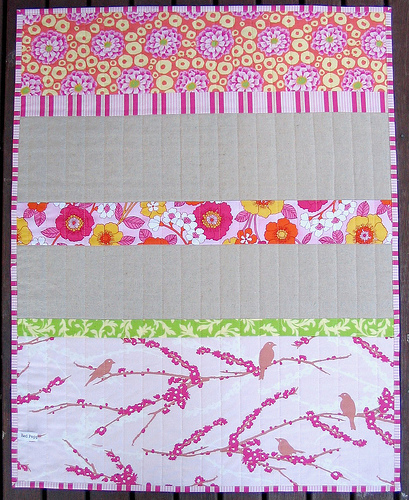 Beautiful Baby quilt, love all the fabrics you used. The stripes are simple and I'm sure sew up fast. I really love it! The fabric combinations are soooo good - and I love the use of the gray on the back! thank you for sharing it with us! I LOVE the pattern with the pink birds...to precious. Your ability to combo so many diverse fabrics/patterns is so amazing.